Summary: Disgruntled residents use a tongue-in-cheek sign to draw attention to an impassable street. Reporter: Amy Marcinkiewicz, WPXI Channel 11 Airtime: 1 minute, 55 seconds on Dec. 23 Visuals: * The sign erected by residents, which reads: "Free Ice Skating in Poplar Alley, Compliments of Monaca Council." * Kids sliding -- and falling -- on a sheet of ice that used to be a street. Highlights: * When anchor Jodine Costanzo leads, "A local family is sending a sign to a borough council, hoping to get their icy streets cleared. It wasn't the storm that left all that ice, but a bigger problem, and they're hoping to finally get enough attention to make it all go away. [Marcinkiewicz] spent the day in Monaca, where she went after those council members." * When Marcinkiewicz reports, "One Beaver County resident believes if at first you don't succeed, start offering stuff for free, and then make fun of 'em. The sign in Jim Fitzsimmons' yard is getting plenty of play: 'Free ice skating, courtesy of council.' But where's the rink? Residents of Elm Street in Monaca say: right here in the back alley. Poplar is very popular with the kids, but it's very dangerous for those driving." * When a sweet-voiced and very observant female neighbor says her neighbors "have had terrible trouble there. They can't get in and out of the garage. The car has slid sideways into other peoples' yards. And they've been asking for help for a long time." * When Marcinkiewicz, saddled up in the driver's seat of an SUV, says through the open driver's window, "We didn't bring our skates, so we thought we'd try the traditional way." As her tires spin, she remarks: "We're not gettin' anywhere, and neither is Jim." * When she adds, "The residents blame council for the ice build-up. Two pipes drain right into [the street]. Council says main streets are a priority. Residents say taxpayers should see all roads maintained. And they say they'll make fun of the situation until resolved." * When another honey-voiced female neighbor rallies to Fitzsimmons' cause: "It's worth it, because [municipal officials] don't do anything to help him. ... I've been to council meetings." * When Marcinkiewicz concludes, "With nothing solved, it's 'skate at your own risk' -- [at least] until that March thaw." What We Learned: It's always good to have all the neighbor ladies on your side! 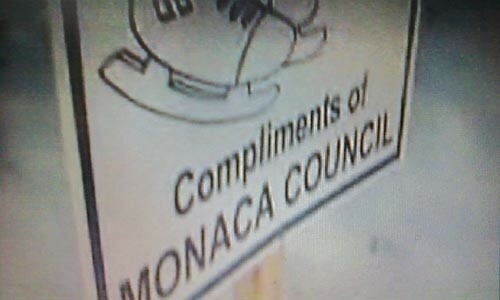 Unanswered Question: When are you gonna clear this up, Monaca? News Value: 4. 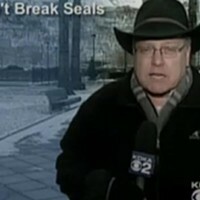 I was hoping the story would live up to Costanzo's promise to see Amy chasing down council members, but that didn't happen ... once again drawing attention to the need for news readers -- er, anchors -- and writers to be more connected to their content. Either way, it's always fun to watch the saucy Marcinkiewicz in action.